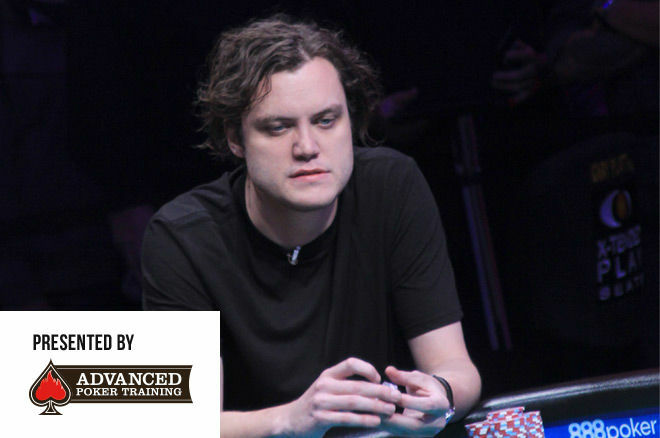 The sixth entry in our November Nine profiles, brought to you by @pokertraining, is Michael Ruane. Each week leading into the World Series of Poker final table we'll profile one player who will be vying for the championship. Our profiles are sponsored by Advanced Poker Training, one of the world's top poker training sites. At AdvancedPokerTraining.com, you can play up to 500 hands per hour of full-ring, six-max, Sit & Go or full MTTs against thousands of intelligent computerized opponents with instant advice, weekly training plans and much more. It's the fastest way to ignite your game! For Michael Ruane, life has come full circle. Only this time, after making the 2016 World Series of Poker Main Event final table, he's doing it with a little bit more money in his pocket. Home for Ruane – pronounced ROO-an – is in New Jersey. There Ruane experienced familiar poker beginnings. He learned the game watching poker on TV and playing home games with friends. He practiced and played alongside his twin brother, but it was his younger brother Sean who would eventually become Ruane's poker companion. Funny enough, Ruane claims to be merely the second-best player in the family, thanks to Sean. Life was good for Ruane. He was playing a game he loved for a living while surrounded by friends and family, as he and Sean pushed each other and improved their games together. Then Black Friday hit and Ruane was left directionless. He headed for Las Vegas in the summer of 2011, notching a couple of small cashes for around $10,000 at the WSOP. At that age, life changes can be made on a whim, and to hear Ruane tell it, there wasn't much though behind his next move. “Someone suggested we move to Malta,” he said simply. That's exactly what they did, they being a group of eight or nine poker players and friends. So began Ruane's poker journey for about eight months in the European island nation of just over 400,000. What stood out there was the scenery. Next was Costa Rice for about six months, and after that, a longer stay in Montreal. Ruane became enamored with the Canadian metropolis, spending two years there he thoroughly enjoyed. Disrupting that flow isn't something Ruane is all that interested in, so he only ventures out for a handful of live events per year. Now, on what he estimates to be his fourth or fifth WSOP Main Event, Ruane has hit the jackpot, finding the big payoff in just a few tournaments that many players spend a lifetime chasing. In the aftermath of bagging the fifth-biggest stack for the world's biggest tournament, he wasn't trying to hide his excitement. “It's the most incredible moment of my life by far,” he said. Day 6 was the big day for Ruane, as he surged from a spot in the middle of the pack that he had occupied for some time, to nearly the chip lead, trailing only fellow November Niner Vojtech Ruzicka by day's end. After winning an early flip to eliminate Jeffrey Kostolni, Ruane scored eliminations in back-to-back hands of Caufman Talley and Cole Jackson. First, Ruane's jacks held against Talley's when the latter tried squeezing all in over a raise and a Ruane call. Then, Ruane was the one with ace-seven calling the shove of a short-stacked Jackson, whose jacks failed to hold on an ace-high board. Ruane's good luck continued as his prevailed against the of Matthew Reed in another preflop all-in confrontation. Jacks played yet another starring role in a big Ruane hand later when he used them to knock out German bracelet winner Paul Hoefer and his . Ruane's propensity for knocking out short stacks continued when Daniel Retallick shoved over his open with and Ruane called with . Even a flop with two kings couldn't stop Ruane, who turned a queen and won with a full house. Day 7 saw Ruane mostly battle for small and medium pots, but there was one big exception. Ruane played a monster pot with Aussie star James Obst early in the day in what the live updates described as an 18-minute hand. It went down in Level 31 (100,000/200,000/30,000). Things began with a Fernando Pons open to 450,000 under the gun, with calls from Ruane on the button, and Obst and Qui Nguyen in the small and big blinds. 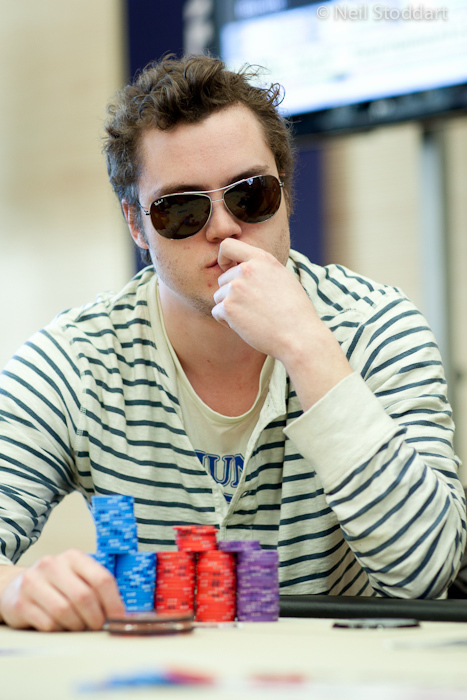 Pons fired a continuation bet of 625,000 after flopped, which Ruane raised to 2,025,000. Obst made it 5,300,000 to play and Ruane stuck around. Obst checked the turn and then called 3,750,000 from Ruane. On the river, Obst came out betting again with 4,700,000. Ruane's aggression continued as he jammed for 13,500,000. Obst tanked for nearly five minutes before releasing, ceding the pot and the chip lead to the American. Occupying Seat 6, Ruane will be seated with Cliff Josephy and Nguyen, the two biggest stacks, on his right. So, the players who can put him in the most danger are mostly acting before him. It's a spot Ruane said he's pleased to be in. “I think I like my table position,” he said. Another piece of good news for Ruane is that short stacks Jerry Wong and Pons are both at least two spots away, so their shoves shouldn't be a major deterrent for him in most instances. Now, Ruane does have Gordon Vayo and Kenny Hallaert in the two spots on his left. The pair of aggressive veterans certainly won't make life easy on Ruane and stealing their blinds will be no picnic. Hallaert demonstrated in one of the opening episodes of the WSOP coverage that he's comfortable getting in preflop raising wars, so Ruane will have to tread cautiously against these two. As for preparation, independent chip model (ICM) homework is at the top of Ruane's list. Such scenarios are critical to understanding how to properly play tournaments with huge pay jumps at the end and Ruane plans to be ready after studying and discussing it with trusted poker associates. A man with a mere $45,000 in live cashes coming into the 2016 WSOP Main Event might be expected to look for more reps playing live poker. Sure, he has played countless hands in his career online, fine-tuning the technical aspects of his game, but many would say there's just no substitute for the pressure cooker of live poker. The often reclusive Ruane did hint he might break out of his shell and hit some live events, but he wouldn't fully commit. Be sure to check out our sponsor AdvancedPokerTraining.com for some of the best poker training in the world. Win a Trip to New York and a Share of £15,000!